An asbestos-lined, 86-year-old steam pipe exploded in the heart of the Flatiron District Thursday, forcing the evacuation of more than four dozen buildings amid "real concern" carcinogenic debris thrown stories high by the rupture could have gotten into people's buildings or air conditioners, Mayor Bill de Blasio said. 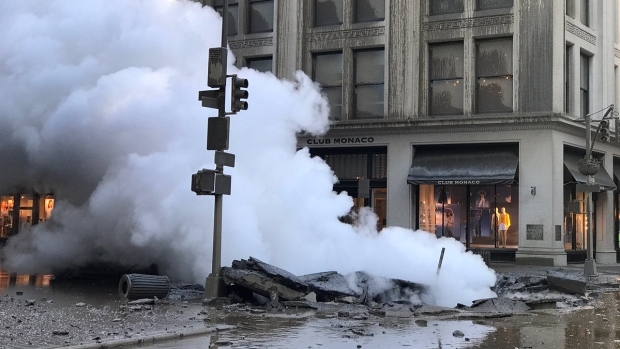 Forty-nine buildings were evacuated when the 20-inch high-pressure pipe exploded shortly after 6:30 a.m., blowing a 15-foot crater in Fifth Avenue near 21st Street and burying Manhattan in a cloud of alternately white and black steam for hours. Twenty-eight of those buildings are in what officials called "the hot zone," and 500 people have displaced from nearly 250 units in those buildings. De Blasio said each one of those 28 buildings must be thoroughly assessed for the potential presence of asbestos, and residents won't be allowed to return to their homes -- with the exception of emergency needs -- until those assessments have been completed. The other 21 buildings that were evacuated will be assessed, but de Blasio said the presence of asbestos is less likely there. By Thursday night, 44 of the original 49 buildings remained evacuated. Fifth Avenue will remain shut down in the area for days as authorities work to clean up the toxic scene, the mayor said. Anyone in the immediate vicinity at the time of the blast should bag their clothes and shower, officials said. The immediate area runs from 500 feet east or west of Fifth Avenue on 20th and 21st streets, and 100 feet north and south on Fifth Avenue. If you're concerned you may have been exposed, there are two decontamination sites on 19th and 22nd streets, both on Fifth Avenue. NYC Emergency Management opened a reception center for those affected at the Clinton School at 10 E. 15th Street. Con Edison personnel will also be there until 10 p.m. Thursday to provide claim forms. Steam was still spewing rapidly from the ground 120 minutes into the emergency response as authorities tried to isolate the source of the blast. Debris, including chunks of asphalt, littered the nearby streets and cars that happened to be at the scene of the time were entirely encased in mud. At least 50 ground-floor businesses -- from fashion retailers to home furnishing stores to fitness studios to restaurants -- have been closed because of the explosion, the Flatiron/23rd Street Partnership Business Improvement District estimates. The blast comes almost exactly 11 years to the day of a steam pipe explosion near Grand Central. That rush-hour explosion on July 18, 2007, shot debris 40 stories in the air, raining mud on midtown. In that case, authorities said an 83-year-old underground pipe near the transit hub failed. A cause of Thursday's blast remains under investigation. Authorities say no Con Edison work was being done in the area at the time, and there's no visible indicator to explain what happened. Con Edison said it did not get any reports of steam coming from the ground there just before the explosion. 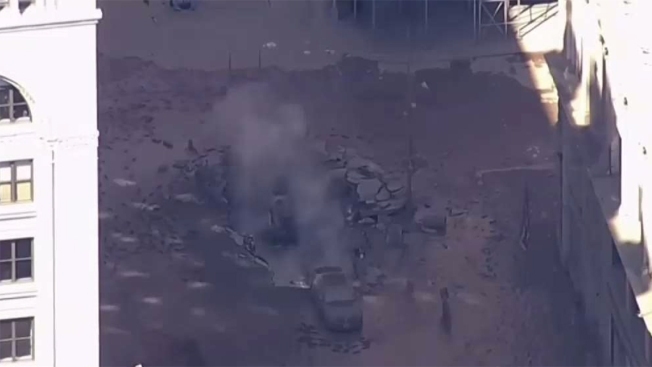 Public records show that there was a permit issued to a private contractor to replace a section of a water main near the location of the explosion, but that work was set to begin on July 28 and had not yet started, according to a senior official familiar with the investigation. It's not clear if the planned water main work had anything to do with steam pipe. Gov. Cuomo has ordered a probe into any potential utility-related links. "As the response continues, I am directing the Department of Public Service to conduct a full investigation into the cause of this explosion and determine whether any utility activities contributed to it," the governor said in a statement. "In conjunction with that investigation, the Departments of Environmental Conservation and Labor are standing by to assist in asbestos testing, assessment and with the disposal of contaminated material." Subway service and traffic in the area is affected. Get real-time updates from all your key transit sources below.